You start with a grid of squares – can be as big as you want it to be. Now two players take turns to draw lines. Each turn can draw a line on any of the sides of any of the grid squares – provided somebody had not drawn there already – and it can be of the length of one side at a time only. (You might remember a variation of this game where anytime somebody completes a grid square, he/she claims that square and in the end you count up who got how many). However, in this game, anybody who completes a shape – any shape – entirely by his/her own lines only – wins. Note that it does not have to be a square or rectangle – it can be any shape. Also there might be lines drawn inside the shape by any of the players – it does not matter. It just needs to be a completed shape with one player’s lines only. Look at the picture below as an illustration. The player with lines with black tips wins. Think of the shape comprising the four squares marked with red blobs – that is a complete shape built by the black tip lines only. Here is the question. Just like the second player in a game of tic tac toe can always prevent the first player from winning, in this game too, the second player can come up with a strategy that will ensure that the first player can never win regardless of how big the grid is. Can you come up with such a strategy? 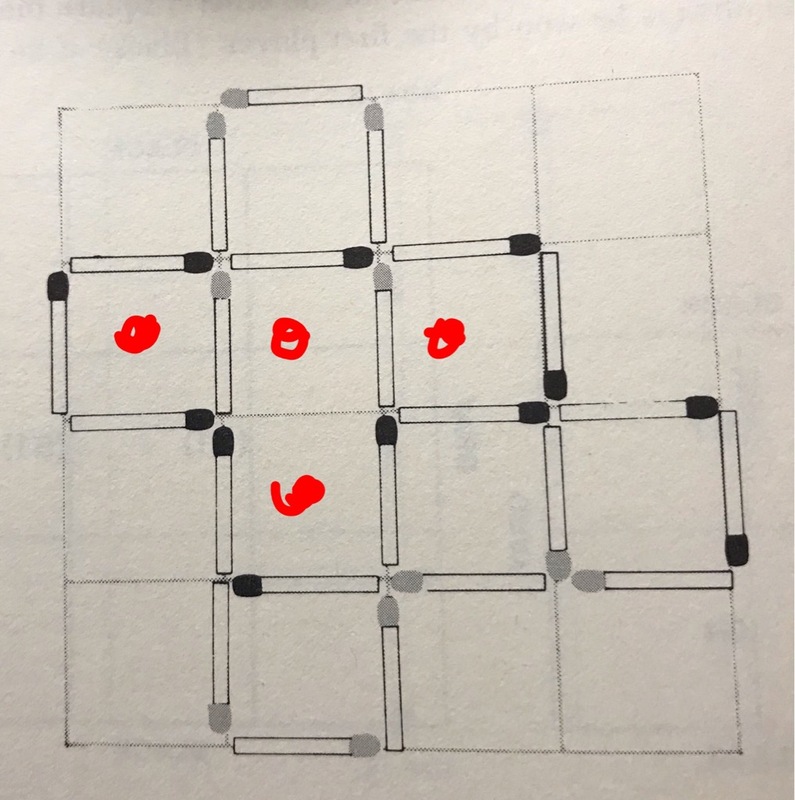 What am I doing wrong with this puzzle? Remember the puzzle I posted last Saturday? https://www.rajibroy.com/?p=18817 The real problem in the book “The Riddler” (thank you Matt Moore for giving me that book) had 7 in the team – not 3. And the answer the book has 7/8. I am getting a far better probability. What am I doing wrong? The problem, to remind ourselves is – randomly a black or white hat will be put on each of 7 of us. We cannot see our own color but we can see everybody else’s color. When called upon to guess our own color, we can call Black or White or we can say Pass. If one calls Black or White and is right, then the whole team wins. If it is wrong, then the whole team loses. However, if Pass is called, another person in random is asked to guess the color on their head. If everybody Passes then the whole team loses. What is the strategy to maximize the chance to win and what is that probability? 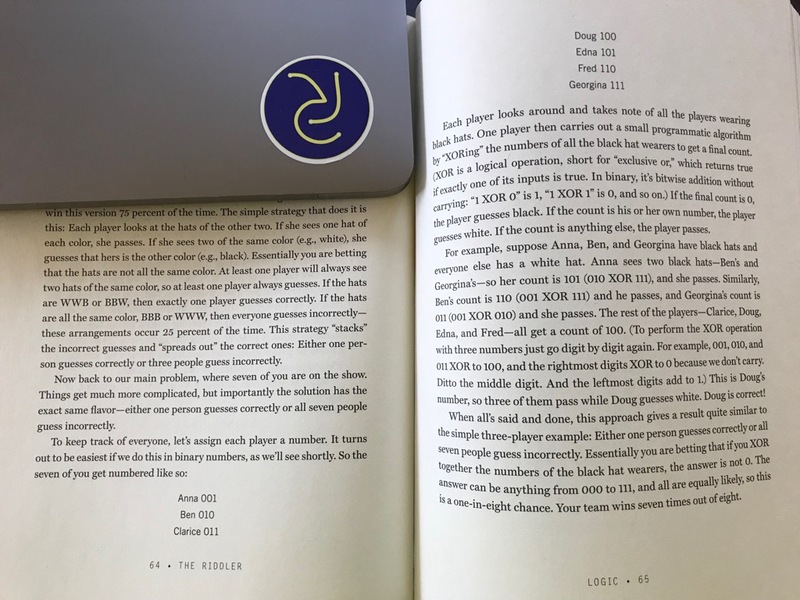 I am attaching the answer in the book which comes to 7/8 (using XOR logic). The first person : If he sees the same color on the other six, he randomly calls a number. Else he says Pass. The second person : Now he gets a chance only if the first person called Pass. Which means the first person has effectively said “All of you DO NOT have the same color”. So, if the second person sees the same color on everyone of the rest five, he simply calls the opposite color. He is guaranteed to be right. If he sees NOT all hats with the rest five to be of the same color, he simply says “Pass”. The third person : uses the same logic. If the rest four have the same color, simply call the opposite color. Else say Pass. So independent of how many original players were there, there are only 2 cases the team loses – when the first person saw everybody else having the same color (all white or all black) and his random guess of his own color turned out to be wrong. Up for a Saturday morning puzzle? This is adapted from a more complicated version submitted by Jared Bronski in “The Riddler”. (Thanks to Matt Mooore who gifted me the book this week). It is one more of those hats on your head and strategy formulation question. There are three of you. Randomly a white or black hat is put on your head. Each one of you can see the color of the hat on the other two but not the one that is on your own head. One by one, you will be asked to guess what color hat you have on your head. Your options are (*) tell a color – Black or White or say (*) Pass. At any point, if somebody calls a wrong color – you all lose. But if somebody calls a right color – you all win. And if everybody passes at the end of first round, then you all lose. What strategy can you formulate beforehand to maximize the chances of winning? And what is that probability? Category: Puzzles | 1 Comment on Up for a Saturday morning puzzle? Read this up in the book “Mathematical Circus”. You have 2 green balls, 2 yellow balls and 2 red balls. One ball of each color is 11 pounds each. The other ball of each color is 9 pounds each. You have a scale and pan balance. (meaning you can compare the weights of two sides – which is heavier and which is lighter but you never know the exact weight). What is the least number of weighings required to find out which are the three heavier balls and which are the lighter balls? Send me personal message with the reasoning. My brother in India and I recently started new jobs and we both travel a lot for work. We still find time to talk to each other once a day – even if for a few minutes. Almost all his work related travel is by trains. And mine by planes. This morning, I had called him and I could hear the sound of the train horn in the background. Trains are still something I get terribly fascinated by. Which got me reading up about railway lines today. Learnt some cool stuff and also realized that so many things I was taught during my school years are not true. Or at least not true any more. a. Which country has the longest railway network (in total miles/kms)? This is something I had to “un”learn! b. Can you think of the largest country that has no railway? How about the second largest country without any railway? Here is a hint – they are neighboring countries. And the first one used to have a railway in its past. But not anymore. c. Think about the longest distance you can go without ever having to change trains. Can you guess between which two cities that train would be running? d. Here is something else I knew wrong. What is the longest railway platform in the world? e. Which is the busiest station in the world? Can you guess the country if you do not know the station name? More people go thru this station in a matter of weeks than the total number of people that go thru the world’s busiest airport in a year! f. How about the longest railway tunnel? Can you guess the country if you do not know the tunnel name? It is a rather new one. Has been in operation for only two years. g. What is the longest railway bridge in the world? Want to guess the country name? It is over 102 miles long. For my friends from Durgapur… that is longer than Durgapur to Kolkata! h. How about the highest railway station in the world? Want to guess the country name? j. Conversely, what is the world’s shortest railway station name? Want to take a guess at how many letters or which country? You would think it should be a straight forward answer. Far from it. The definition of a “country” is not as clear cut as I had thought it would be. There are countries that the UN recognizes. Then there are are completely autonomous areas with their own government and no control from outside – but they do not go for UN membership (e.g. Cook Islands). Kosovo is not a recognized country by UN, but it competes in the Olympics as a nation. In fact, if I have this right, there are 195 sovereign states recognized by the UN, 201 partially recognized states, 204-207 de facto sovereign states, 206 Olympic nations, 211 FIFA countries and get this – 249 countries that have their own ISD (country code for telephone numbers) codes! 1. Which continent is Greenland in? 2. 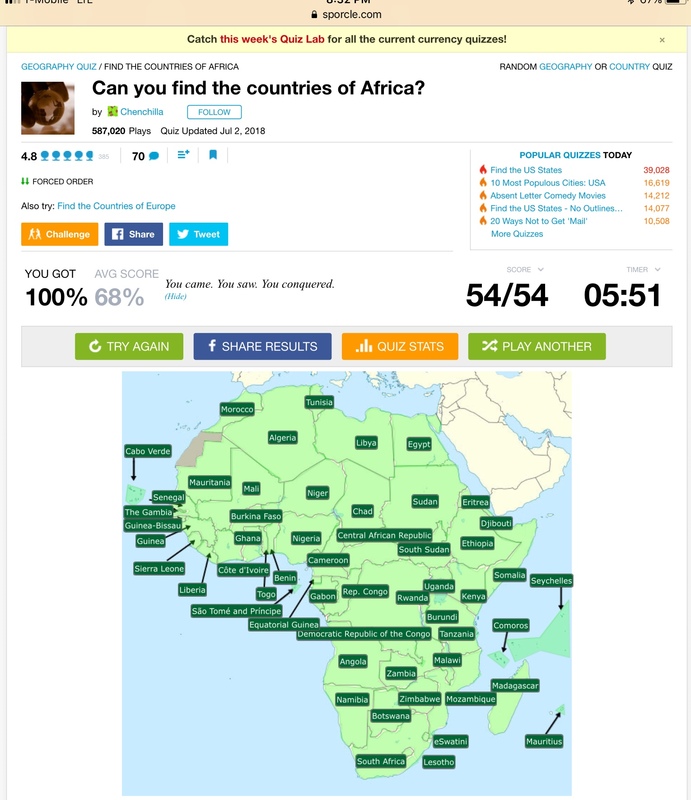 Which is the continent with the most number of countries? 3. Which is the continent with the least number of countries? 4. How many countries have contiguous area that straddles over two different continents? 5. This one is specially for my friends who live in the USA like me. How many countries in our continent? I was led to this problem by my great friend Karthik’s son – Aadi – who is a whizkid in logic and numbers problems. I need to spend more time with him just to learn about more puzzles. This problem was published in New York Times as the Tax Man Problem. I have changed the description a little – but the problem is the same. 1. You pick a card. 2. I get to pick all the factors of that card that are remaining on the table. 3. We continue with this. 4. You CANNOT pick a card if there are no factors of that card left for me to pick. 5. Finally, when you have run out moves (there is no card left for you to pick without violating Rule 4 OR there are no cards left on the table), the game is over. 6. Now we add up our cards. Whoever has higher total, wins. My total: 48 . I WIN!! Question: What is the highest total you can get and win? Continuing with the learning of the Dark Continent, managed to nail all the African capitals in two different tests in first chance. Forget my knowledge in Geography… trying to memorize names everyday for about 20 minutes might be a good way to stave off age-driven memory loss issues. Also, who knew there are cities called Ougadougou, N’Djamane, Mbabane or Bujumbura? That was a lot of fun! 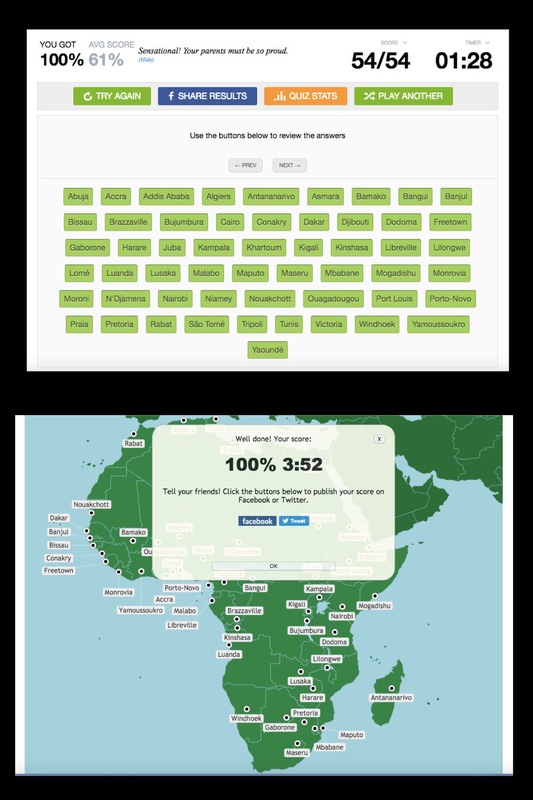 After studying about African countries (just their location and their names – no more, yet) and Nikita and I doing the jigsaw puzzle every afternoon for fun, finally, I was ready for the test on Sporcle. The 4 minute plus probably is not a stellar time but I am telling you – Africa does not make it easy on you with the country names. It has Guinea, Guinea-Bissau and Equatorial Guinea. I think their Department of Naming Diversity was headed by an ex-Atlantan (we call all our roads Peachtree). There is a Republic of Congo and then to make it more interesting, there is a Democratic Republic of Congo. Funny part is Gambia – which foresaw that other countries might also call themselves with similar names – made the preemptive move of putting the definitive article in its name. It calls itself “The Gambia”! The kicker? When Portugal ruled it, it was called “A Gambia” !!! Next round of studies … capitals of all those countries. This is going to be much more difficult since there is unique shapes and locations to visually remember like I could for the countries.